§ Samaris is a short graphic novel where the landscape has the archaic charm of Jules Verne and the dream menace of Franz Kafka. The debt to Kafka is acknowledged as the hero is called "Franz" and his frustration in fulfilling his mission to Samaris is similar to K.'s frustration in trying to access the governing authorities in The Castle, that Kafka masterpiece of inter-war claustrophobia and dread. The Verne feel is in the graphics, the old world architecture, the whimsical mix of early technology, and the sense of adventure when journeying into the unknown. So, the narrative has science fiction inclinations, although its main business is the exploration of the unwilling hero's psychology via symbolic imagery and a peculiar, inverted sense of happenstance. "One morning they came to my door..."
So it starts. The Council of his home city of Xhystos want Franz to travel to the distant city of Samaris to find out what happened to a previous mission which failed to return and which included three of his friends, including Clara, the younger sister of his lover Anna. He's reluctant to take on the assignment, but 20, 000 Paz and the promise of a seat on the Council sways him. He visits some friends at the "Stork Club" -- they think he's crazy, as no one comes back from Samaris. Likewise his lover Anna, who, as she disrobes for his (our) pleasure, says, "Don't expect me to wait forever, Franz. This will be our last night together." It's a long journey... days, then weeks. First a street car, then a steam engine, followed by "altiplane", which is a low-flying biplane which, by necessity, has to circle the various cities en route. This might be due to the vortical pattern the cities make when looking at them on a map, although the technology of this world is early 20th century at best. After 8 days, when he arrives at Trahmer, no one wants to take him on the last leg to Samaris. Eventually an old pilot called Ryad agrees and they head off in his aircraft and after 8 days, land just outside the vaulting walls of Samaris. "There seemed to be quite a mix of architectural styles, as though the city had preserved elements of each of the civilizations it had preserved." He finds a hotel... the only hotel. The desk ckerk is brusque, not at all friendly, behaves as if Franz is just a nuisance. The card players in the lobby look at him suspiciously as he passes on his way to his room, where the windows have been blocked... "Because of the humidity," says the clerk, although the explanation seems false. There's also an ominous whistling sound that the clerk apparently doesn't hear. He meets the beautiful "Clara" in the hotel, who resembles his lover Anna, could be connected to her missing sister, as the name is the same... maybe she recognizes him, maybe she doesn't. She claims she's never heard of a city called Xhystos, goes on her way. Meanwhile the streets and buildings of Samaris alter in subtle ways; they seem the same but aren't. It's like he's trapped in a world of partial recognition somewhere between deja vu and amnesia. What happens next? Does Franz succeed in his mission? Does he get back to Xhystos and his friends at the Stork Club? Or like K. in The Castle, does his narrative end broken in mid-sentence? 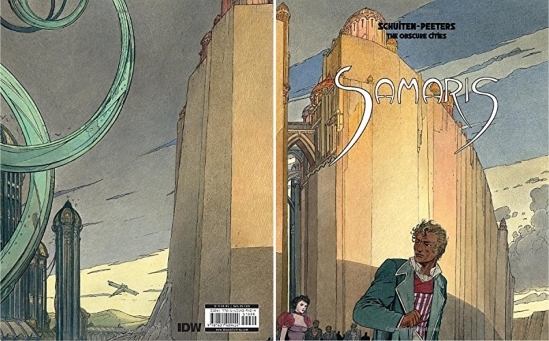 Samaris: a dream journey with pre-natal overtones, with engaging, atmospheric architectural graphics by Francois Schuiten. Maybe the start is a bit slow and the ending a bit of a cul de sac. But overall it's an interesting work of sustained ambiguity, even if the explanation, when it comes, seems insufficient. Graphic novels, you say? Why not -- even this years' Nobel Lit winner Kazuo Ishiguro says he's considering writing one.